She was born Vivian Roberta Jones in Cherryvale, Kansas, with a brother and four sisters. After the family moved from Cherryvale to Independence Kansas, she studied drama under Anna Ingleman and William Inge. Their next move, to Albequerque, New Mexico brought her to the Albuquerque Little Theatre, which provided her the money she needed to study under Eva LeGallience in New York. After arriving in 1932 she had trouble finding work until she began a two-year stint in Jerome Kern and Oscar Hammerstein's "Music in the Air." She next understudied Ethel Merman in "Anything Goes." Her first starring role was as Kay Thompson's last minute replacement in "Hooray for What!" starring Ed Wynn. Other Broadway costars included Danny Kaye, Eve Arden and Nanette Fabray. In 1945 while starring in a touring company of "Voice of the Turtle" she had a nervous breakdown. 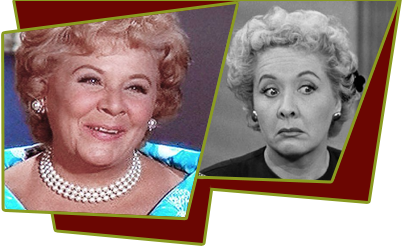 After undergoing psychotherapy and limited movie work, she returned to "Voice of the Turtle" at the La Jolla Playhouse, where she was seen by Desi Arnaz who decided she was perfect for the role of Ethel Mertz in the I Love Lucy television series. It took a lot to convince Lucille Ball for her new side-kick, but in the end it was a friendship that lasted throughout each of Lucy's TV series. At the beginning, Vance did not want the role of Ethel Mertz as she thought it was too frumpy. She also hated being cast as the wife of William Frawley who was over 20 years her senior. Their relationship was not cordial as Vance did not like William Frawley. After I Love Lucy ended she divorced her first husband, married again, and moved to Stamford Connecticut. In 1962 she began work on The Lucy Show, but the pressures of long-distance commuting didn't suit her, so after three years she limited her performances to guest appearances. In 1974 she and her husband moved to Belvedere (just north of Francisco Bay) so she could be near her sister. Vance made her final television appearance with Lucille Ball on the CBS special Lucy Calls the President, which aired November 21, 1977. That same year, she suffered a stroke which left her partially paralyzed. Vance died of bone cancer (secondary to breast cancer) on August 17, 1979. She was cremated and her ashes scattered.